Perhaps it shouldn’t come as a surprise that Paso Robles, a former ranching town turned fashionable winemaking region, can produce wines that go down easy with steakhouse fare. It’s the reason why, on a recent school night, my husband and I headed to Gramercy Park for a tasting of recent releases from Paso Robles wine country at BLT Prime. A quick GPS refresher: Paso Robles, in northern San Luis Obispo county, hugs California’s central coast, and is midway between Los Angeles and San Francisco. The region has a rich and colorful history. Franciscan friars introduced grape growing and wine-making around 1790, establishing mission vineyards that were later abandoned when Mexico banished the clergy from the missions in the 1830s. Not to worry: a Frenchman, Pierre Hypolite Dallidet, found his way to the area in 1853 and planted a commercial vineyard; commercial winemaking began in the late 1870s. In the meantime, Drury James, uncle of outlaw Jesse James, and a co-founder of the town of El Paso de Robles (later shortened to Paso Robles) developed the mineral hot springs in the area that eventually made Paso Robles a resort destination. These days, as a wine-making region, Paso Robles is “hot”. Over the last decade, the number of bonded wineries has jumped from 50 to over 180. And its viticultural appeal has not been lost on winemakers from other regions. Like Foley Family Wines, which includes EOS Estate Winery in its portfolio. And Turley Wine Cellars, owned by cult winemaker Helen Turley and her brother Larry, has a tasting room in Templeton. At BLT Prime, we dug in, family-style. 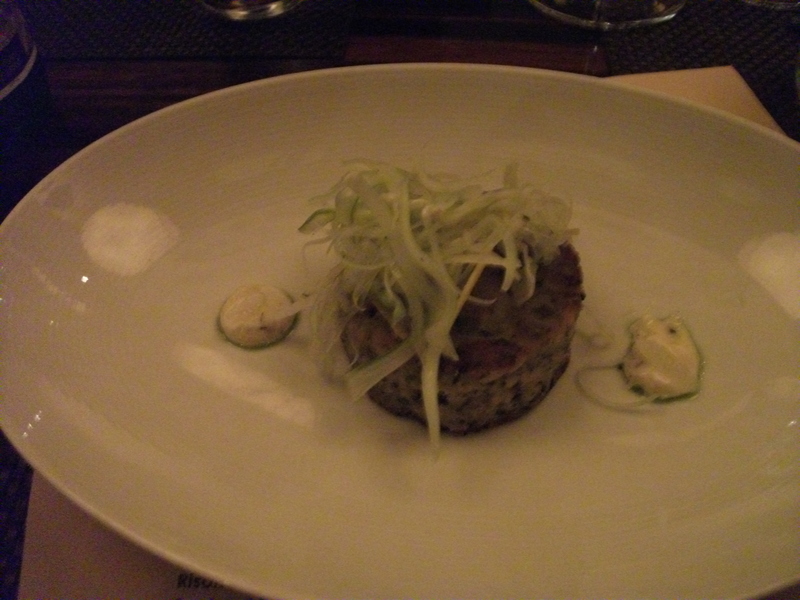 We began with crowd-pleasing steakhouse starters: a silky, warm pate on grilled bread; handsome blocks of tuna tartare bathed in a soy-lime dressing; ethereal, melt-in-your-mouth popovers and crab cakes topped with radish salad (right). Two white wines were poured: the 2010 Halter Ranch, Cotes de Paso Blanc and the 2009 Viña Robles WHITE4 . A Certified Sustainable farming and winemaking operation, Halter Ranch, which was established in 2000, is an up-and-coming boutique winery. The 2010 release ($24, left) is a classic southern Rhone Valley blend of Rousanne, Grenache Blanc, Marsanne and Picpoul Blanc varieties, with a floral nose and tart mineral finish. Nice. However, my husband and I were immediately enamored with the 2009 Viña Robles WHITE4 ($14, right). Apparently, we’re not the only ones—this Viña Robles release has been a wine critics’ favorite; it also picked up a few competition medals last year. Vermentino stars as the main grape variety, with Verdehlo, Vigionier and Sauvignon Blanc. Complex yet light, it’s beautifully balanced with stone fruit and tropical notes, zesty acidity and a clean finish. 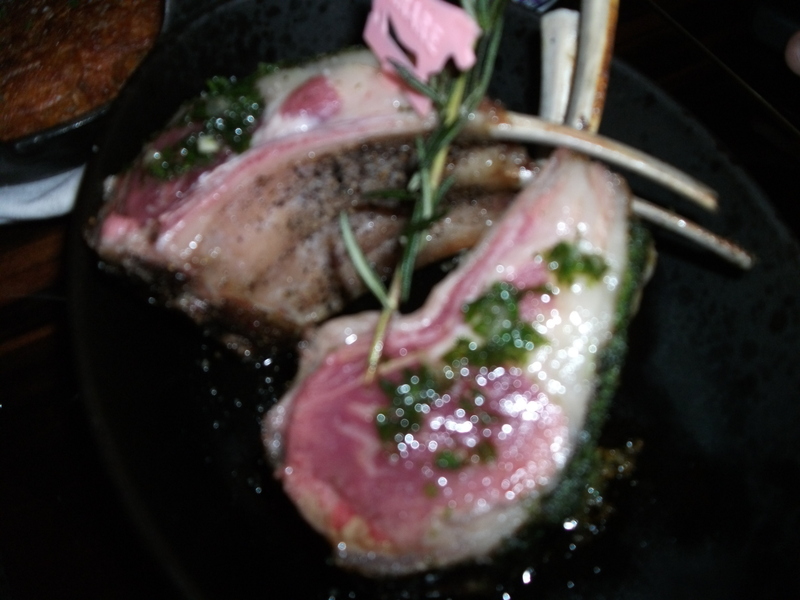 Our respective red meats—I had ordered a 22-ounce rib-eye; Chris, the rack of lamb—arrived in cast-iron cocottes. With them, came a flurry of sides: grilled asparagus; roasted Brussels sprouts; jalapeno mashed potatoes; and leek hashed browns. When you’re about to ravage a beautiful piece of red meat, your choice of red wine can really make a meal. There was no reason to worry: we sampled two delectable reds. With its inky ruby red hue and deep cherry bouquet, the 2008 Treana Red Blend ($37; right)—70% Cabernet Sauvignon and 30% Syrah—from Hope Family Wines is lushly fruit forward. Definitely chewy and muscular with pronounced tannins, Treana is a classic red wine that pairs well with steak. But, my husband and I agreed….if it’s possible to fall in love with a wine at first taste, then we both fell for the 2007 Tablas Creek “Esprit de Beaucastel”. “It’s the most age-able wine we’ve ever made from an almost perfect vintage,” says Tablas Creek general manager Jason Haas. What makes Esprit de Beautcastel a standout red wine that pairs effortlessly with red meat? Christopher shares the details here. Unfortunately, we discovered, the 2007 vintage has been sold out for some time. But, if you see it on a restaurant wine list, order it. You won’t be sorry. This entry was posted in Restaurants, Wine and tagged BLT Prime, California's Central Coast, Halter Ranch, Hope Family Wines, Paso Robles, Tablas Creek, Treana, Vina Robles, wineries. Bookmark the permalink.